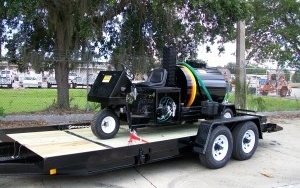 The Desco D-200 Distributor is a precision spraying machine designed to apply asphalt rejuvenator material. The rejuvenate is a dark brown to black cementitious material in which the predominating constituents are bitumens which occur in nature or are obtained in petroleum processing. This machine is capable of applying this material at a coverage rate of 0.04 to 0.08 gallons per square yard with ground speeds of 85 yards per minute (2.9 mph) to 150 yards per minute (5.1 mph). When spraying, the ground speed is maintained at a preset value determined by the coverage rate desired. This control is actuated when the foot pedal is fully depressed in the forward direction. A digital meter on the control panel monitors ground speed. A 27 horsepower engine drives a hydro-transmission pump for ground speed propulsion. There is a constant pressure auxiliary hydraulic pump to operate the material pump, power steering and spray bar. The left side of the control console contains the engine tachometer/hour meter, and the switches for the lights. The instrument lights are turned on when the front light is turned on. There is also a circuit breaker to protect the light circuits. The panel also contains a chart relating coverage rates to material flow rates and ground speeds, and a chart showing tank capacity versus liquid level. The right side of the control console contains the ground speed monitor and control, and the material pump flow rate monitor and control. The POWER switch on the left side activates this panel, and the circuit breaker protects these circuits. The spray bar is an enclosed 8-foot wide design with 10 spray tips. The spray bar manifold is split with 6 tips on the left side and 4 tips on the right side. Each spray tip is fitted with a shut-off valve to permit individual tips to be turned off. The spray bar is optimized at 1.5 gpm per spray tip, or 15 gpm total material flow when all 10 tips are activated. The “NORMAL” position of the PUMP SPEED CONTROL provides a material flow rate of 15 gallons per minutes. As the control knob is turned clockwise, the material flow rate is increased to approximately 20 gpm, and as the knob is turned counterclockwise, the material flow rate is reduced to approximately 5 gpm. The spray bar control is interlocked to permit spraying when the spray bar is in the “down” position only. is the Maximum Ground Speed.